The National Academy of Medicine (NAM) has selected the University of Illinois at Chicago’s Dima Qato to serve as its 2018 Fellow in Pharmacy. During her two-year term as a fellow, Qato will collaborate with researchers, policy experts and clinicians from across the country in support of the National Academies of Sciences, Engineering, and Medicine’s mission to solve complex problems and inform public policy decisions related to science, technology and medicine. Qato’s research focuses on access and safe use of medications in vulnerable populations, including refugee and immigrant populations. She utilizes population-based methods to better understand the underlying mechanisms responsible for the use, underuse and unsafe use of medications; how these patterns may influence health outcomes and health disparities; and what can be done from a community and policy perspective to address these growing public health problems. Her goal is to promote public accountability in ensuring access to, and safe use of, medications at the national, state and local levels. In an effort to achieve this goal, Qato is interested in incorporating the role of pharmacies — including their accessibility, quality and safety — with the concept of “essential medicines” in payment and regulatory decision-making in ongoing health care reform. 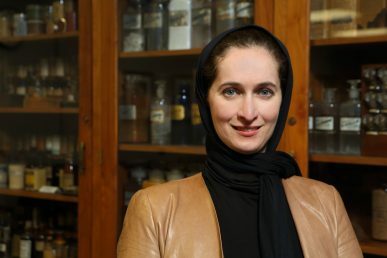 She earned a Doctor of Pharmacy degree from UIC, a master’s degree in public health from the Johns Hopkins Bloomberg School of Public Health, and a Doctor of Philosophy degree from the UIC School of Public Health.